What is the Idea Model? The Idea Model comes after our super handy Idea Napkin and before tools like the lean canvas, business model canvas, or business plan, in a series of practical tools for designing change. We like to think of it as a bit of a home plate from which you can do the work required to design the ‘really big value version’ of your own idea. It’s also been designed to support a deliberate design process that includes value proposition innovation, customer deep dives, pretotyping of your offering, and a build-test-learn cycle. Most people find getting that from hunch to business plan (or even to the simpler business model) isn’t nearly as straightforward as they expected. The Idea Model helps you bridge that gap in a step by step way that’ll have you answering the right questions and designing the most highly impactful and imminently feasible version of your idea. 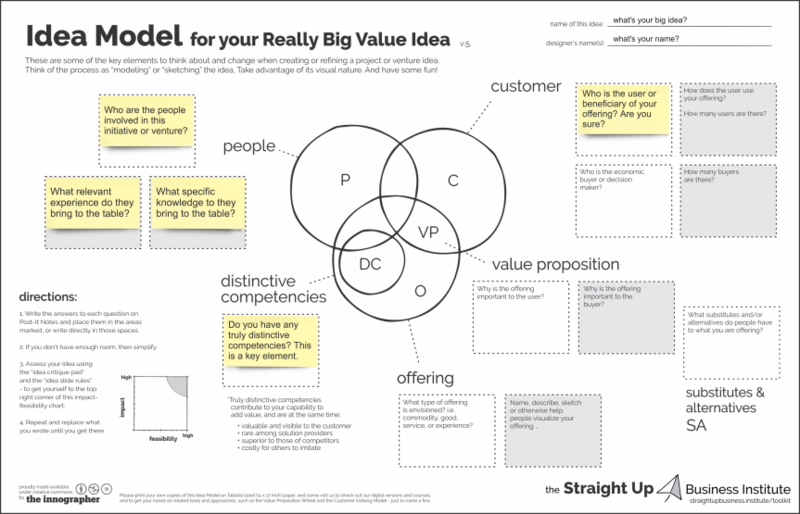 Whether you’re working up something new or you need to go back and look at the fundamentals of an existing business, the Idea Model can help you focus on the right things. We find people who take the time to develop an Idea Model begin see things more clearly and can then take their value creation work to a deeper level. Do you teach / coach tomorrow’s leaders? This is a great tool for facilitating a conversation with an employee, manager, innovator, or entrepreneur. It guides conversations, forms the basis of a lesson, captures and defines ideas within a portfolio, and boosts a practical ideation or strategy session.